Hmm… another free VPN service. If you’ve read our previous reviews on free VPN services, you’ll know where this is headed. So let’s get this party started! Choosing the right VPN for you is essential for those looking for privacy, security, and perhaps a little Netflix or torrenting. We’ve laid all the information you might need to make the decision that much easier for you. Users aren’t required to make an account for both the free version and the VIP version. SuperVPN got that much right, at least! IP and DNS Leak Test: Leak-free! Suffice to say, SuperVPN is reliable in terms of being leak-free. We tested their servers out and were please by the results. SuperVPN has decent speeds. Although it wasn’t exactly what we’d consider great, we were able to watch videos and download stuff okay. It’s not going to win awards, but it’s also not so poor as to be unusable. Free VPNs typically have unimpressive speeds and SuperVPN doesn’t stray from that convention. This free VPN has a total of 7 servers. 2 of those 7 servers–Japan and England–can only be used by VIP users. What’s interesting is the vague Global server they have on their server list. What does that mean?! Where exactly is the Global server located? Who knows? Either way, this is a very disappointing show from SuperVPN. Offering just 7 servers is beyond lacking – it’s embarrassing. We used their US server and their weird and mysterious Global server to check if their servers actually get through to Netflix. No bueno on both occasions. Many paid VPNs and some free VPNs get through Netflix using their US server – no luck in this case. This is unfortunate for users who want to watch Netflix securely – SuperVPN fails to live up to its name, as much of this review will show you. Looking for a VPN to get you into Netflix? Check out our list of top VPNs for Netflix. Get your torrenting streak going with our top recommended VPNs for torrenting. Users may choose to stick with the VPN for just a month ($5.00), 3 months ($14.00), 6 months ($27.00) and a whole year ($52.00). You’ll save $8 off on their annual plan, but it’s really up to you and your needs if SuperVPN deserves your money. Let’s admit it, $5 is a pretty steep price in return for what the VPN gives you. The free version lasts for the first 20 days. After that, you will have to reconnect every 60 minutes, which is pretty annoying. We’re not sure how their refund transactions are processed and under what circumstances they grant it. Their Google Play entry doesn’t have any link to their website or of the VPN’s developer. 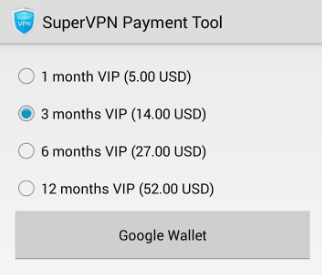 If you wish to become a VIP user, you have to download another app called VPN Payment Tool. You can download it on Google Play. Once you’ve opened it, you’ll notice right away that they only offer Google Wallet as their sole payment method. That’s an immediate bummer for users who might have other methods in mind such as cryptocurrency or other convenient and/or anonymous methods. 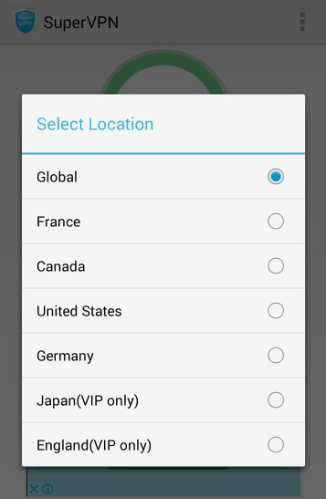 SuperVPN is on Google Play and nowhere else. This implies that the VPN is only compatible with Android devices. That’s pretty barebones. There’s nothing wrong with specializing, but looking at the popular VPNs who cover just about everything with an electrical current, this is again, lacking. In fact, lacking is the word to sum up SuperVPN! The interface is mostly ads and partly their service. Since their services are free, putting ads in their application is how they survive. After opening the app, you’ll see a Continue button sandwiched in between ads. You can connect immediately, and you’ll be connected to the Global server by default. 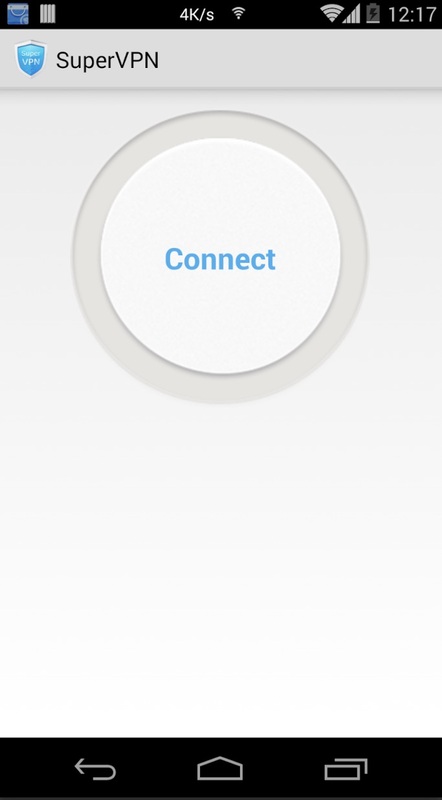 However, if you wish to connect to their other servers, you can press the button located on the upper right corner of the app. It contains Select Location, Buy VIP, Share, and Feedback. Press the Select Location button and pick a server you like. It’s certainly not the best or the most efficient layout since a lot of the necessary buttons aren’t all laid out in front of the users immediately. The large and distracting ads are also a big hurdle for SuperVPN’s app to be considered user-friendly. There’s no live-chat or ticketing system here, folks. The closest thing they have that allows users to interact with the developers is their Feedback option. Again, it is accessible by going to the upper right corner of their app that has a list of features. If you wish to give them feedback, you first have to answer a captcha. Afterward, you’re given the option to select which app you want to use to give them feedback like Gmail, etc. 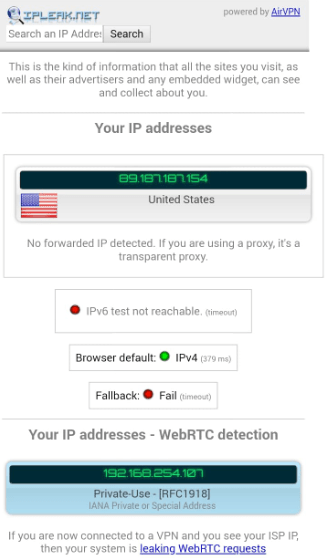 This VPN’s vagueness doesn’t stop at whatever they mean by their Global Server. You shouldn’t take this lack of information as bliss, though. Even though they don’t require users to register and put in personal information, there’s still the possibility of them getting a hold of the information you have on your Google Play account. Privacy-conscious users, avoid SuperVPN like the plague. We tried sending them an inquiry about what encryption and protocol they’re using at their email because it’s not indicated on the app or on Google Play… and received no response. The fact they don’t lay the details out readily for their users to know exactly what protocols they’re using to protect customers is a hassle. Plus, it makes it harder for users to decide if the VPN is right for them. Add this to the list of disappointments SuperVPN has chalked up so far. This free VPN does not have a kill switch. It’s fairly common for free VPNs not to provide this feature since they’re not being paid for this extra protection. If you want a kill switch to prevent you from being exposed during sudden disconnections, that’s understandable. Unfortunately, free VPNs may not be for you. As you’ve seen during this review, free VPNs are extremely basic, and if they’re free, your data is usually the product. SuperVPN is developed by SuperSoftTech. It’s linked to a person named Jinrong Zheng who appears to be the developer behind this VPN. More relevant information can be found on Amazon.com and the email address connected to the Google Play Store. According to the information they gave on Google Play, they are based in Singapore and currently have over 50m users worldwide. Technically, Singapore isn’t a member of the 14 Eyes Alliance. However, there have been reports of Singapore operating as a close partner of the 14 Eyes Alliance members in data sharing. It’s up to you to decide what to make of this information, and whether it’s worth taking the risk (it isn’t, not for such poor service). Hey, it’s free, what more could we ask for? With what we’ve seen, we’re only ever going to use this VPN if we want a service that’s only good for bypassing some firewalls and there are no other free VPNs. This is because SuperVPN has wildly irritating ads and slow speeds; plus, they can’t even bypass Netflix. If you’re looking for a VPN just to get through some websites, it might still work for you. It doesn’t require any personal information and based on the tests, the connection they give their users is stable and secure. That’s about as nice as we can be about SuperVPN. We usually never recommend free VPNs and SuperVPN is no exception. If you’re looking for a service that’s actually good, check out our top recommendations here.